Kozy Konversations: We have gone jar crazy! 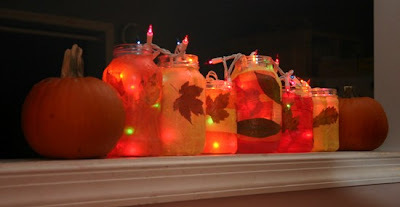 Check out our Autumn jars! We have gone jar crazy! Check out our Autumn jars! 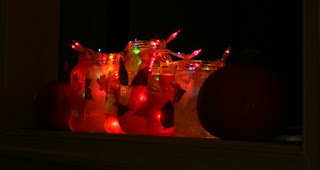 I love, love, love these lighted jars. I love the ambiance they give the room and the house. They are a perfect accent! So when I took down our Halloween Jars everything looked blah, and I didn't want to wait till after Thanksgiving to pull out the Christmas Jars (and we need to make more anyway because we gave some as gifts). So I said . 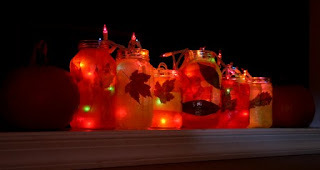 . . hey, lets do autumn jars!! I figured we could just do autumn colors and to make things simple, we would just collect leaves from the yard and decoupage them on. Much easier for me because the kids weren't cutting, making a mess with paper etc. I am not going to get into the process again, but if you want to know how to make them check out my 2 previous blog posts HERE and HERE. I had them choose which color or colors they wanted for their jar out of what I had. I only had orange and rad tissue paper so I improvised and used napkins to get yellow. I wish I had some brown because I was curious how it would turn out, but alas, none to be found (and I was not going to the store). They really did most of the work again, with me helping mostly the little ones. 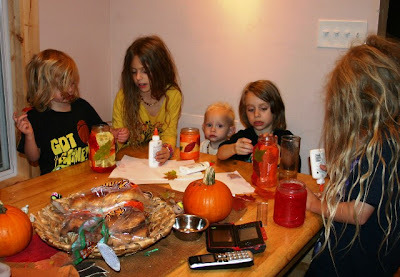 The napkins were a bit tricky so I did do most of the mod podge on those. 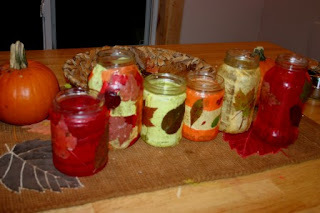 I had them just glue the leaves on with glue (some were tricky and I had to work with them to get them to curve around the jars and stick) and then we did the mod podge once they were stuck well. I know they will turn brown (though some were brown already) but it doesn't matter, they are for the silhouette against the colored tissue paper when the jar is lit. I used the multicolored lights again because I couldn't get to the white lights, but I think ideally white lights would provide the best light . . . though the colored lights are softer. You could really do anything you want that is autumn theamed, but these were easy for us! We actually did these start to finish in 1 day (had them lit by evening) which is a record for us (usually I have a table full of scrap paper and partially decorated jars for days before we are finished). I love these jars so much that I am thinking of how I can have them year round . . . Valentine jars, Easter jars, July 4th or summer themed . . . so many possibilities!! Now, for an added photo . . . because hey, pumpkins are autumn themed and I didn't want to do a separate blog post with just a picture of me . . . but I did want to show y'all how I dressed up for Halloween . . . . 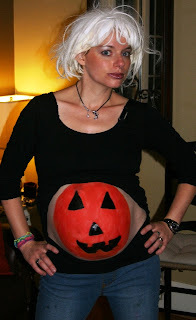 I did the same thing the only other time I had a belly on Halloween, when I was 29 wks pg with Ever . . . LOTS of fun (and lots of comments from people).